The AHS™ was designed from the ground up, not assembled from off the shelf parts. It's the only proven Wayside Horn that improves safety for motorists and pedestrians at railroad crossings while dramatically reducing noise pollution created by train horns in populated areas. The Automated Horn System™ is also the only tested wayside horn. The AHS™ is the only wayside horn system using patented technology. 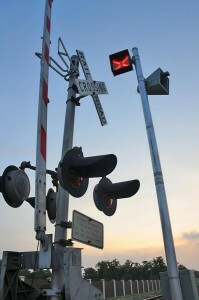 The Automated Horn System™ is mounted on a pole at the crossing, rather than on the locomotive. It delivers a longer, louder, more consistent audible warning to motorists and pedestrians while eliminating noise pollution in neighborhoods for more than one-half (1/2) mile along the track. The AHS™ is designed to sound like a train horn but the sound is directed up and down the street instead of through the surrounding neighborhood. This gives quiet back to residents over a mile away. See the AHS™ vs a train horn. Click Here to see how a wayside horn system works. 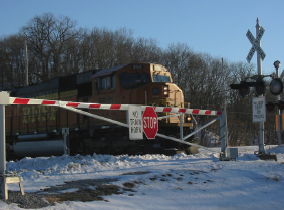 The Crossing Closure Verification System™ is designed to relieve train crews of the responsibility of sounding the locomotive horn at crossings when the roadway closure crossing gates are in the closed and latched positions. Once the gates are in the closed and locked position the CCVS™ flashes a signal indicating that the train crew need not sound the train horn. The new Federal Railroad Administration Train Horn Rule specifies that the closure system shall be equipped with a monitoring device that contains an indicator which is visible to the train crew prior to entering the crossing. The indicator shall illuminate whenever the closure device is deployed. The system provides a special, coded DC pulsed output which energizes a transmitter coil within the gate arm. This transmitted code is then received by a magnetic proximity receiver located within the fixed receiver post. 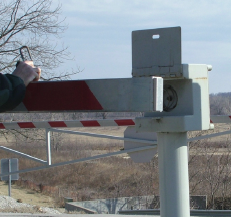 The gate arm must be physically compressed and latched into the receiver post before the signal path can be completed. Once both gates are latched into their receiver posts, the Universal Quiet Zone Indicator consisting of an orange, LED “X” each direction, flashes a special pattern notifying the train crew that they need not sound the train horn. This system allows communities to consider a temporary closure option as part of their quiet zone approach. This unique verification system can also be applied to any number of other signal applications. 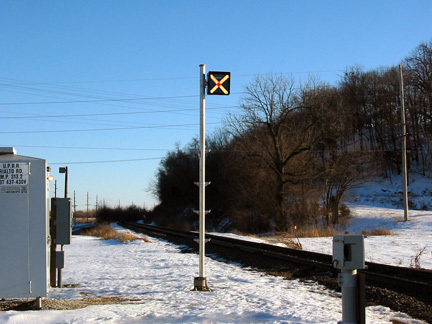 The Universal Quiet Zone Indicator™ (UQZI™) is an LED display intended to notify the crew of an approaching train of the integrity of a Quiet Zone. Under the Federal Railroad Administration Train Horn Rule, communities are provided with various safety treatments which can be employed at selected crossings in order to establish a designated quiet zone. Once established in accordance with the regulations, all normal train moves through the Quiet Zone are required to proceed without sounding the locomotive horn. • Monitor for broken gate arms at two-quadrant gate crossings or one-way crossings within a Quiet Zone. • Nighttime closure systems to verify that manual gates are closed establishing the Quiet Zone. • Four-Quadrant Gate systems with a gate management or vehicle detection system for monitoring gate arm integrity as well as highway-vehicle-detection scenarios. • Wayside Horns indicate the integrity of the system.